The Regal is a feature-rich lift/recliner designed for people who like to keep things within hands’ reach. Its dual flip-open arms conceal extra storage space, a cup holder and hideaway tray. A luxurious three-pillow waterfall back can be adjusted, providing more comfort options. Stylish and superbly constructed, the Regal will allow you to kick back and relax in first-class comfort. 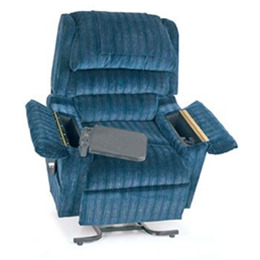 is a feature-rich lift/recliner designed for people who like to keep things within hands’ reach. Its dual flip-open arms conceal extra storage space, a cup holder and hideaway tray. A luxurious three-pillow waterfall back can be adjusted, providing more comfort options. Stylish and superbly constructed, the Regal will allow you to kick back and relax in first-class comfort.